After many years designing clothing with her sister in their Barboglio Cristina & Jan Collection, Jan Barboglio began sculpting accessories and furniture for her own home. Her childhood, spent in north central Mexico, would prove to be fertile ground for inspiration, and every object created by her would carry with it the rich history and romance of old Mexico. Barboglio's initial designs of wax grabbers were for her silver, bronze and iron candelabra. Altar pieces and house blessing crosses were integrated into her own home furnishings. Her love of entertainment would later result in her own iron chargers, platters and chafing dishes. Leather goods and saddle stools began to fill her home. All of these influences are evident in her Jan Barboglio Collection of today. Jan Barboglio's original designs led the way for her current and extensive home accessories line. The Jan Barboglio Collection has since flourished into crosses and crowns, fleur de lis and scrolls, wildflowers and roses, guardian angels and symbolic bleeding hearts. From her signature Box of Miracles which houses 12 metal "milagros", prayer and family crosses, Barboglio is now well-known for bringing the spiritual aspect of old Mexico to home decor. 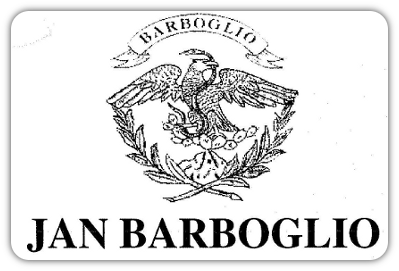 In recent years, Barboglio would expand the collection with accents of glass, wood, mortar and wax. Heavy goblets and vases of clear bottle glass accompany the dining pieces. Wooden tables and crosses in natural and dark tones would become notable for complimenting the burnished iron of her early work. Gesso wings, tiny hands, a cross standing among roses comprise her popular fragments collection. Her signature candles often illuminate her many designs. Jan Barboglio's expanding furniture and accessories collection is now widely recognized for quality and style, and she is legendary to her collector base for her attention to detail. Her designs are popular with collectors of all ages and are easily distinguishable for her quality and style. Barboglio has forged this following through her rich history and story telling ability, such as through the Milagro cards included with each purchase. In every detail, Barboglio is known among her collectors for turning everyday living into something magical.